"Don't be afraid of COLOR!" Ok, so color can be scary. I love blue but on my walls? Color is one of the best parts of design. It makes a space "lived-in". It's the easiest way to show personality and fill a room with life. Plus, in terms of permanence...it's minor. If it were up to me I would paint my walls a new color every year but my pesky husband thinks that is ridiculous... I call it creative! So, you may be confused, now I'm telling you to "Do White Right!". Well, the truth is white can be colorful. The colorful part comes in the use of interesting shapes, objects, and accessories. 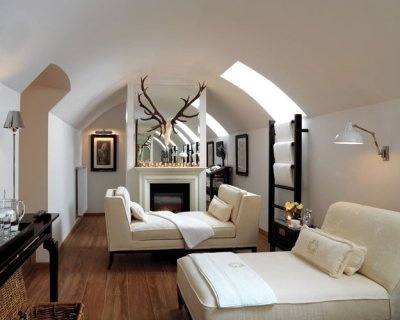 This room would be bleak without the amazing deer antlers above the fireplace (it's the elephant in the room). The best way to make white shine is to ground it with texture (like these amazing wood floors) and your room will come alive! "Make sure to size your art correctly!" Art can make a room! I also believe it's best when it means something. But, whether it's a picture reminding you of a moment in your life or something you picked off the shelf at Crate and Barrel, it MUST be sized right. 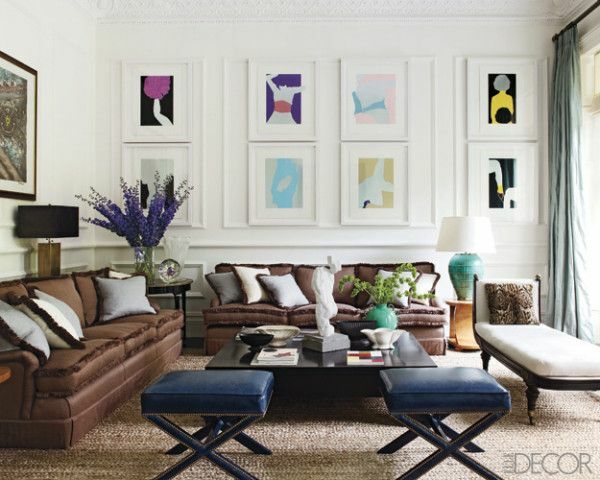 Nothing throws a room off more than a postage stamp piece of art on a large wall. Use a single large print or cluster but always...make it BIG, make it BOLD, and make it a STATEMENT! Consider furniture as art you can sit on. Make it unique. Don't forget how much it can add to a room. An unusual color on dining chairs is just an example of how you can make a space pop. I love using color on traditional furniture giving an eclectic cool vibe to any space! That antique store find...paint it hot pink next time! "Symmetry can be your friend!" While a room that is perfectly imperfect is a thing of beauty it should be left to the experts. When pulling a room together you can not go wrong with symmetry. It's an easy way to balance a space and make it look finished. It's elegant and can still be fun with the right pops of color. Everyone will think your designer put the room together but it can be done by almost anyone (I will keep it our little secret)! "Make it classic and make it modern but it doesn't have to be classic modern!" Some people want to run when they hear the word "modern". It is one of the most misunderstood words in design. People instantly start seeing cold rooms with one piece of furniture consisting of a hard black leather cushion and polished chrome arm rests. While I think this look can be beautiful, it is not for everyone. Clean lines can be comfortable. The goal is to make the space look current and fresh. Start with a classic base and layer on more modern patterns and textures to create a room that is both classic and modern. "Don't hire a designer to make everything match. Hire a designer to coordinate your space!" Anyone can select everything from one store and make it work...but that's boring! A unique space has pieces from all different sources. It mixes a few different styles into one well coordinated look. Layering patterns and textures is the key to an interesting space. Creating this mix is what makes a space feel lived-in, fresh, welcoming, and completely yours.